When it comes to hosting corporate events, you need a menu that can appease all tastes and palettes. 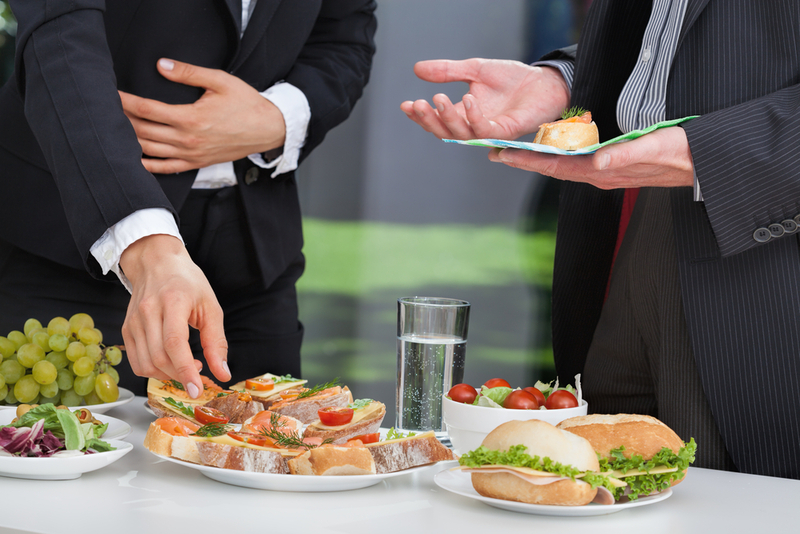 Whether it’s a catered breakfast, lunch, or dinner, we offer a wide variety of items through our corporate catering services that are fresh, tasty and exactly what you need for any professional setting. Take a look at a few of the most popular items that we serve up at Centurion Conference and Event Center. Start your early morning meeting off on the right foot with one of our energizing menu options. For a small to medium sized gathering, we recommend the Continental Sunrise that features a variety of all your favourite light breakfast options. Your team will enjoy chilled orange and cranberry juice, hot Columbian roasted coffee and assorted teas served alongside sliced seasonal fresh fruits and a spread that includes three options: Montreal style bagels with cream cheese, low-fat baked muffins, freshly made fruit danishes, or butter and milk grain croissants. It’s the perfect way to reward your team or give them the energy boost they need to stay focused during your event. When you’re hosting a more extensive meeting that requires a greater selection of items, our breakfast buffet is the perfect choice. This spread will make everyone happy with nutritional beverages like our individual fruit smoothies and a number of popular hot and cold food items. Enjoy our Belgian waffles topped with mixed berry compote and Ottawa maple syrup, or our hot half moon quiche filled with baby spinach and sautéed mushrooms served with smoked bacon, country link sausages, and roasted breakfast potatoes. And for the lighter eaters, a side of low-fat muffins and butter and multi-grain croissants are served with fresh fruit trays and a Canadian cheese platter. Not sure what to order or have picky staff? Well, don’t fret. Our corporate catering services also include a Make Your Own Sandwich option. That way the pressure is off and everyone will have the freedom to choose between their favourite assortment of rolls and bread, along with fresh toppings and our mouth-watering meats like Montreal smoked meat and Italian mortadella for their own creation. Plus, they’ll get to enjoy our creamy potato & leek soup, fresh market vegetables and dip, homemade hummus, and egg salad on the side. One way to always engage and win over your employees is with our hot Italian catering option. This option includes mouth-watering items like hot roasted tomato and oregano soup served with caesar salad romaine, topped with smoked bacon and creamy dressing for the starter. Then our Italian classic hand-rolled spinach and ricotta manicotti with fresh tomato and basil sauce is served hot alongside our grilled chicken breast with sautéed mushrooms and marsala sauce. The Italian meal also features herb roasted garden vegetables, garlic and rosemary PEI potatoes, and delicious tiramisu for dessert. When it’s time to spoil your employees, the Hot Beef Eater option is a great way to go. This popular dish comes with mouth-watering top sirloin of beef aus jus, creamy cheese tortellini, a mix of seasonal vegetables, sweet potato puree and arugula, pear, and dried cranberry salad on the side. And if everyone has some room, a puree chocolate layer cake with fruit skewers will be available for dessert. When you want service that can deliver the quality and variety you need, our corporate catering services are sure to please. Our facility offers everything you need in one location, or we can come right to your office setting to serve hot, fresh items at your convenience. Contact us at Centurion Conference and Event Center today.